June 30, 2016, an internal seminar related to 2d gel electrophoresis was held in Creative Proteomics, a biotech company offering all kinds of services and products concerning research use. The topic of this senimar was to discuss the future direction of two-dimentioanl gel electrophoresis. 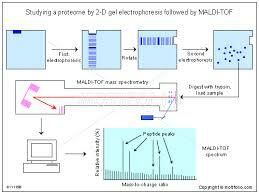 Two-dimentioanl gel electrophoresis, also written as 2d gel electrophoresis has preceded and accompanied with the discovery of proteomics subject. For a long time, this technique with its standout features and advantages has been widely used in proteomics experiments, however, it is no longer the only approach used in modern experiment presently. In this internal seminar, scientists firstly discussed its history and then they come up with some ideas of its future. At the beginning of 70s, due to the complexity and strong tendency of protein samples used in all kinds of biological experiment, two high-performance electrophoretic separations of proteins were available to scientists---zone electrophoresis of proteins in the presence of SDS and denaturing isoelecric focusing. Although the 2d gel electrophoresis technique is being regarded as the protein screening process with high resolution, high reproducibility, quantitative, label-free intermediate read-out, its limitations in the analysis of membrane proteins and the expression dynamics of proteins still can not be ignored. “with more than ten-year study on this technology, it has been now a mature scheme in Creative Proteomics.” Dr. Scott continued: “and it still has much room for growth, its potential has not been discovered completely.” Some other scientists also pointed out that those limitations of this technique, in the near future, should be improved. What’s more, because of the rapidly incresed market competitiveness, it is necessary for Creative Proteomics to develop more advanced technologies to develop this technique. Although now it can offer high-quality services for its customers, more time is needed to study on its potential. According to this small-size seminar, we have a brief version of 2d electrophoresis technique and we also believe with the help of experienced scientists, this service in Creative Proteomics will have a bright future.